Residents of The Aston, which houses law students, have reported losing heat during some of D.C.'s coldest days, as well as dissatisfaction with GW's FIXit service. More dialogue between students and GW’s facilities operators might help prevent the next early morning fire drill or heating outage. That’s what Residence Hall Association President Ari Massefski is hoping for. Members of GW’s Division of Operations who focus on day-to-day work in residence halls will meet with RHA leaders starting Friday, with the goal of improving communication between students and the University in dealing with fire drills and power, heat and hot water outages. Massefski said the RHA meets with the Division of Operations regularly, but these meetings will focus on student feedback to planned power and water outages, as well as other housing-related issues. 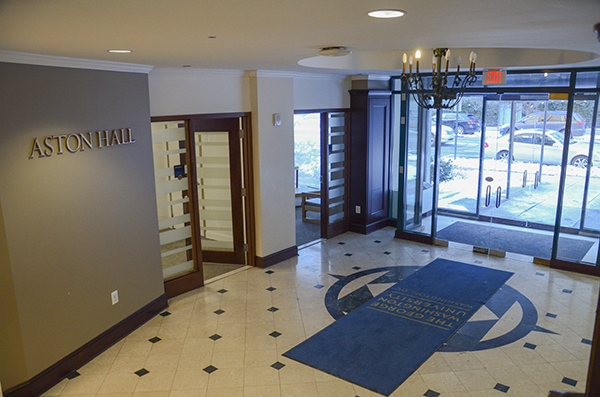 The meetings are the first to be formalized with the director of facilities and property managers on a monthly basis, and come as residents of The Aston, Fulbright Hall, JBKO and City Hall have complained about heat and hot water loss. They say those issues have been compounded by poor communication with FIXit officials. “It’s a regular standing meeting with people who are in the buildings doing the work to make sure student feedback is involved,” Massefski said. He said he hopes the meetings will amplify student voices in the University’s conversations, including those about when to schedule utilities outages. Massefski pointed to two instances of possible disconnect between students and GW. In December, City Hall residents lost power and WiFi during finals, prompting the University to formally apologize and give each resident a $400 reimbursement. “They shouldn’t have done power outages the week before finals because people have papers due that week,” Massefski said. Earlier this month, Massefski said a fire alarm went off in International House at about 6:30 a.m., which did not stop until more than an hour after students were allowed back into the building. Meanwhile, several residents in The Aston, which houses GW Law School students, have said they are frustrated with a lack of heat, as well as poor FIXit service. Patrick Tierney, a first-year law student who lives in the building, said when he called FIXit to submit a complaint about losing hot water, those on the other end of the line seemed unsympathetic to his situation. University spokesman Kurtis Hiatt said there have been no hot water outages in The Aston in recent months, but confirmed that GW is looking into some heating problems. Heating outages are more common during the winter because of extra stress to heating equipment, he said. “Currently, we are aware of a few rooms with heating issues and are working to resolve them as quickly as possible, and we apologize for any inconvenience this has caused,” Hiatt said, adding that students should always submit a FIXit request as soon as they notice a problem. Kelsey Magill, a sophomore who lives in Fulbright, said her heating stopped during an especially cold weekend earlier this month, which marked some of D.C.’s coldest days on record. Natalie Cleveland, another Fulbright resident, echoed those concerns about communication. The sophomore said FIXit’s response was oftentimes delayed, possibly because of red tape. “A lot of times, especially in multiple-step processes with multiple people, some of that information just seems to get lost in all the bureaucracy,” she said.